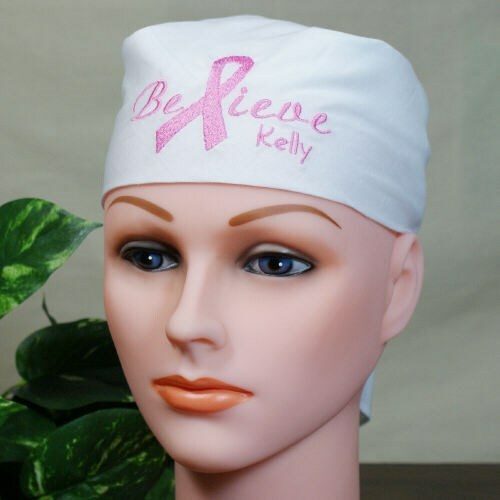 This Embroidered Believe Bandana is a fantastic item for spreading breast cancer awareness. It is the ideal addition to any outfit, and it would be the best Breast Cancer Apparel accessory for your next breast cancer awareness walk. I really like this. We ride in benefit rides all the time. Great way to say I believe. Today’s Price: $10.99 In Stock! THIS IS MY ABSOLUTE FAVORITE ITEM. Not only is it gourgeous, but the personalization makes it so special. Thank you for all your products. I am sharing the website with everyone I know, survivor ot not!! This was a perfect way to show my support fo Breast Cancer Awareness while on our motorcycle. I wear it every time I ride. Additional Info MyWalkGear.com is your one-stop shop for Personalized Breast Cancer Gifts. We carry a unique and extensive line of breast cancer awareness Apparel and Keepsakes! Wear Personalized Breast Cancer Apparel at your next Breast Cancer Awareness event.